Chalkboard Wall Tips Don’t Make This Mistake! A few years ago I added a chalkboard wall to my kitchen. 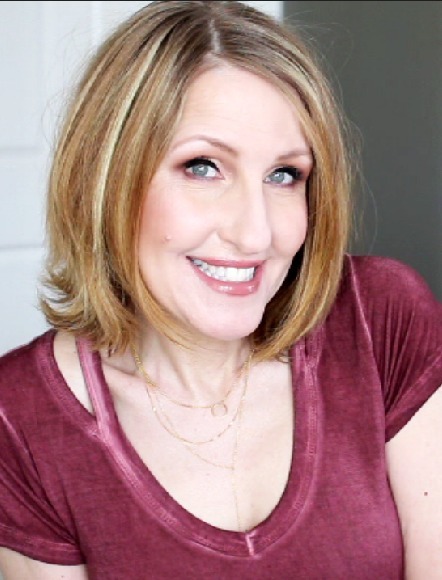 (This post contains affiliate links, please read disclosure policy) Recently I had a reader ask me what kind of paint I used on my chalkboard wall. And she wondered, how I achieved a smoky look. 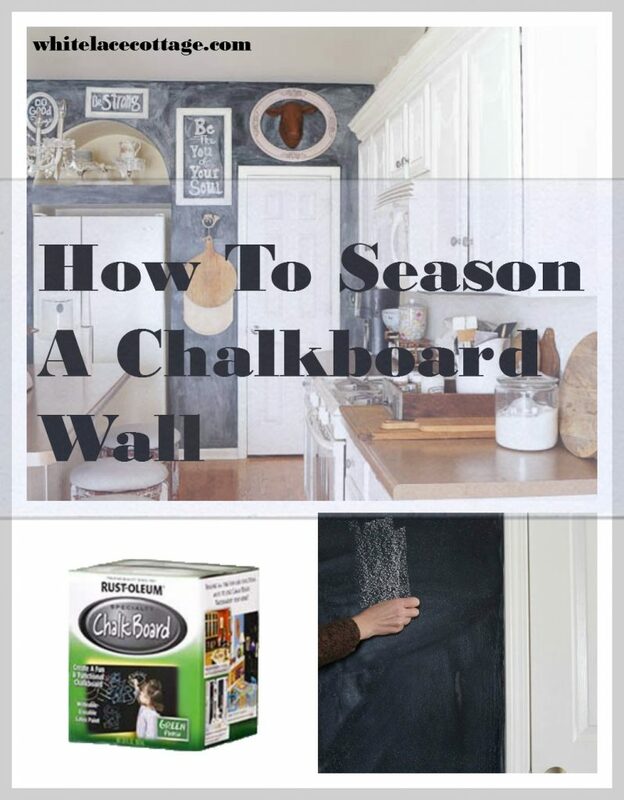 Today I thought I would share a few chalkboard wall tips. But first let me share the paint I used. It’s the typical chalkboard paint, not the paint used on furniture. 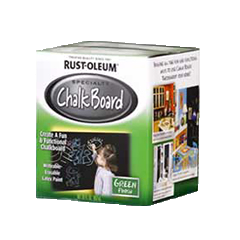 I used this chalkboard wall paint by Rust-oleum. It has great coverage, very low odor and easy to use. My kitchen wall took two coats of paint. When your paint is fully dry you want to season the paint. Let me explain first why it’s important to season your wall. If you don’t season your wall first before writing on it with chalk, you’ll leave permanent writing on your wall. You don’t want to make this mistake! So make sure you season your wall first. You only need to season your wall once. I already seasoned my wall, but since I am showing you how to do it, I wiped my wall down first with a damp rag. I think you’ll be able to see what I am doing better. Take your chalk and lay it flat against the wall. Next rub the chalk up and down vertically. You are going to use a lot of chalk depending on the size of the wall. And this will get a little messy with chalk dust on the floor. After you finish rubbing the wall with chalk vertically, begin to rub the wall with your chalk going horizontally. Do this on the whole wall. Once you are done you can take a damp rag and wipe down your wall. And now you can see why and how you get that smoky look, it’s from the chalk. As the chalk dust dries on the wall it leaves the wall looking smoky. You can go into word on your computer and check out different fonts for letters. Or do what I did, and go to picmonkey. I found a font that I liked, then I enlarged it on my computer screen so I could see it from a distance. But you can also print it out on your computer and put it next to you as you are writing. To make your chalk writing stand out on your wall dip your chalk into a little bowl of water. As you are writing it will look a little faded, but once it’s dry you will see a brighter white. Keep a few q-tips or an old rag on hand as you are writing. Any mistakes can be wiped off easily and redone. I added a few frames to my wall shortly after painting it. I like the way my words are the focal point of the wall instead of words written all over. They have more meaning to me. Adding a chalkboard wall is a fun way to add an accent wall that can be changed simply by the art that’s created on it. What do you think? Would you add a chalkboard wall to your home? Let me know in the comments. Never would I have a chalkboard wall! My children would drive me nuts scratching on it! I would have to move! My worst room to decorate is our front room, library. Too hard to explain. Will have to send a picture sometime! LOL….. Amber. Yes please send a photo. be Stong ?? shouldnt it be Be Strong? Love that idea! Wish I had that when my kids were younger! You have a great looking kitchen! I love this idea. Perfect for practical reasons and just for fun! I invite you to share at my blog hop ( you can link up until Sat night) Hugs! Those are good tips. I never knew about dipping your chalk in water to make it brighter. I forgot to season the chalkboard in my sons room so you can see imprints of some writing that was erased. That’s a great tip to season the wall first. I now know to do it and learned from my own mistake! This post was so needed!! 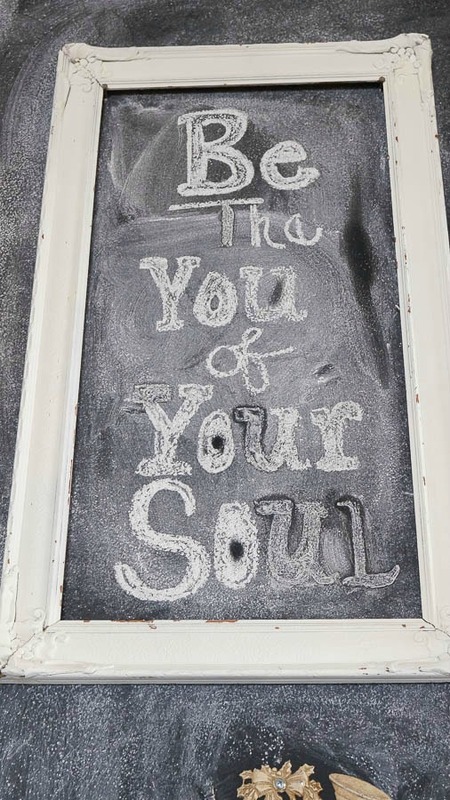 I never thought of ‘seasoning’ my little chalkboard art & yes, it can leave permanent & might I add annoying marks!!! I just love your wall , home & informative post!! Thanks so much for sharing fellow blogger!! Love the idea And your kitchen. Where did you find your bar stools? Would I ever paint a wall using chalkboard paint? Yes….but only now that my children are grown and our grandkids live so far away, that when they would come, I’d be happy to put up with the dust on a limited basis. The remaining artwork would be great to leave for many days as a reminder of their happy visit!